The science reporter Kirioka goes to investigate after a man is stabbed in a Tokyo amusement park haunted house attraction. A set of military id tags are found on the body. The nightclub owners Onishi and Takashi then also receive id tags, which makes them fearful. They realise it relates back to fourteen years earlier when they, as military officers at the end of the War, were transporting Dr Nikki and his research to be set up in a cave. When they discovered that the crates contained gold, they decided to take the gold themselves seeing as the War was over. Lance Corporal Tsudo protested that the gold belonged to the people whereupon they shot him. It now appears that Tsudo is not dead and has returned to take revenge. Kirioka joins the police efforts and follows clues that lead to a plant. There they discover that Dr Nikki has perfected a teleportation machine and that the still alive Tsudo is using it to teleport in to locations and take revenge on those who left him for dead. Japan’s Toho studio had great success in the 1950s with the very first Godzilla (1954). This set them on a path that continues to this day. Over the next few years, they put out a host of other monster movies with the likes of Rodan the Flying Monster (1956), Varan the Unbelievable (1958) and Mothra (1961) and various alien invasion/space opera films such as The Mysterians (1957), Battle in Outer Space (1961), Gorath (1962) and Dogora the Space Monster (1964). In the mid-1960s, they began to pit monsters together in title fights and then combine them with alien invaders. One of the mini fads amid this was a spate of what you might call mutant supervillain films, which also included the likes of The H-Man (1958), Secret of the Telegian, Attack of the Mushroom People/Matango, The Fungus of Terror (1963) and The Human Vapor (1964). It is possible that Secret of the Telegian might have been inspired by the US film The 4D Man (1959) concerning a scientist who invents a process that allows him to pass through walls, which came out the former year. I am not much of a fan of director Jun Fukuda’s Godzilla films (see bottom of page). That said, Secret of the Telegian, which was made before he signed onto the Godzilla franchise, works quite well. Fukuda approaches it as a crime film where the heroes are detectives and a determined reporter. It is interesting to see the backdrop (in the early parts) of what are clearly Tokyo gentleman’s clubs. The most interesting aspect is villain Tsudo whose teleported appearances look like a grainy and not properly focused hologram. 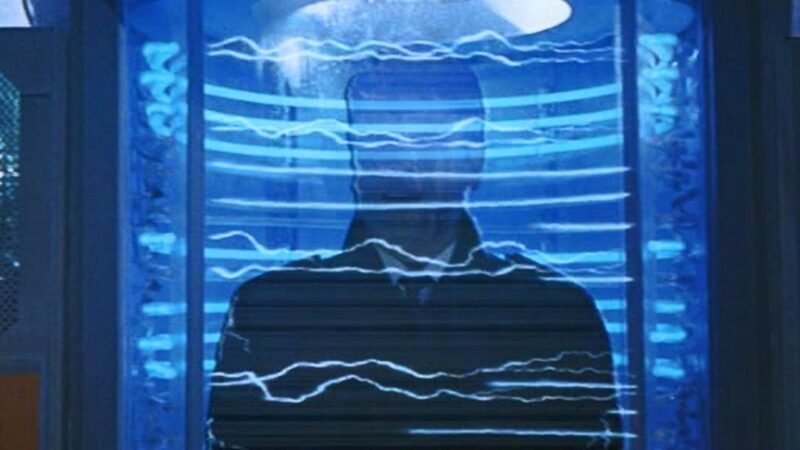 (Although these are unevenly applied – hologram-like in some two shots, while in others or shots that take place from behind, he is seen as a regular human figure). Despite the term ‘telegian’ in the title, this is never actually used throughout – the Japanese title Denso Ningen translates as ‘telegraph human’. Almost all Toho films from this period have some kind of heavy message subtext. The one here would seem to be making a point about those who have exploited from the War with a subplot about the villains being those who stole gold for the war effort and used it to line their own pockets and justice being exacted by Tsudo who stood up to say that the gold belonged to all the people and was shot for doing so. Secret of the Telegian was the second film directed by Jun Fukuda, a former assistant director at Toho, who later became a regular on the Godzilla series. Fukuda’s Godzilla films include Godzilla vs the Sea Monster/Ebirah, Horror of the Deep (1966), Son of Godzilla (1968), Godzilla vs Gigan/Godzilla on Monster Island (1972), Godzilla vs Megalon (1973) and Godzilla vs the Cosmic Monster/Godzilla vs the Bionic Monster/Godzilla vs Mechagodzilla (1974). These are generally regarded as the point where the Godzilla series became silly and juvenile, no longer taking itself seriously. In genre material, Fukuda also made Espy (1974) about a team of government psychics and the space opera War in Space (1978).